The intuitive controls, combined with the user-friendly VersaWorks Dual RIP software enable users to confidently start production within hours of installation. ECO-UV ink is available in CMYK, White and Clear options. Clear ink offers spot gloss or matt finishes as well as stylish embossed effects. White ink adds touches of brilliance and ensures bright colour quality on dark or clear substrates. The ink instantly dries to deliver a wide colour gamut with sharp detail and rich colour density. It requires no degassing and conforms around curves and irregular surfaces. ECO-UV ink is extremely durable for both outdoor** and indoor use. Ink is supplied in “clean-hands” 220cc cartridges and is safe after curing. The LEF-12i uses Roland’s Automated Ink Circulation System to help produce consistently brilliant image quality even on long print runs. With controlled ink circulation, the ink pigments are unable to settle in the ink lines, creating a smooth consistency and density for outstanding output all the time. The LEF-12i features an industry leading one year RolandCare warranty included in the price. And for worry-free and unattended printing, Roland OnSupport sends e-mail or smartphone alerts to let you know when ink is running low or a job has been completed. So you can be safe in the knowledge that your device is supported by some of the most advanced technology and comprehensive warranty packages in the industry. 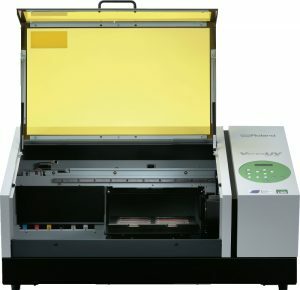 The built-in laser alignment system allows quick set-up of the LEF to print on different media. It represents the easiest and most effective way to uniformly print images on multiple substrate targets. Whether using it as a two-point reference to determine flat substrates or a centre origin point of reference to print on curved or odd shaped items, the LEF’s laser alignment is an incredibly sophisticated and useful feature. The LEF-12i plugs into a standard electrical outlet. Using a fraction of the power that other flatbed printers demand, it offers significant savings on electrical costs per year. The LEF-12i uses a long-life UV-LED lamp for curing to offer users true on-demand production without the typical warm-up time. By providing a light source that is entirely ozone free and emitting light in the range known as Near-UV on the UV spectrum, the LEF-12i offers a safe alternative to conventional UV lamps. To make the LEF-12i even more energy efficient, it automatically enters a low-power mode when not in use for an extended period of time. Proper ventilation is required during ECO-UV production and an optional BOFA Air Filtration Unit, designed for use with Roland DG devices, is available to virtually eliminate odours and to act as a stand and storage unit for jigs, fixtures and supplies. Personalise everyday objects and turn them into unique items that can command a premium price and a higher profit. 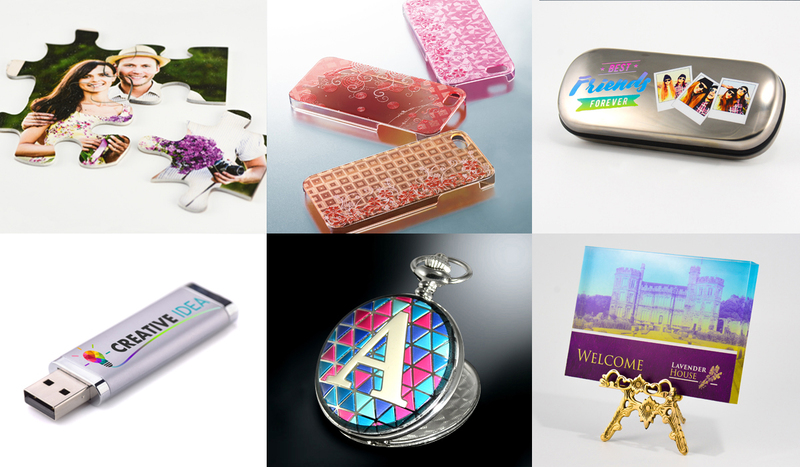 Print text, photos, logos or other designs directly onto a huge variety of items, including smartphone cases, gifts, gadgets, stationery, golf balls, promotional items, industrial components and electronic devices. Roland VersaWorks Dual, the latest generation of our powerful and user-friendly RIP software, is included with this device. Packed with features to help maximise the efficiency, speed and quality of your output, VersaWorks Dual utilises PDF and PostScript® engines to deliver faster previewing times and improved handling of PDF, EPS and PS files. Quickly and easily preview and process complex files with transparencies, drop shadows, special colour layers and other special effects directly in the RIP to minimise the need for design software; saving time and simplifying the production process. Rotate, set spacing and maintain clipped position within the RIP to give you more control when printing graphics and applying effects. Alter UV lamp intensity to optimise ink drying. The VersaUV LEF-12i is safe to use in any busy print shop, industrial or retail environment. It features a protective cover to safeguard users from moving parts and to prevent dust from entering the print area, while keeping the UV-LED light contained. An optional air filtration system is available for the VersaUV LEF-12i. This includes an activated carbon filter, ink storage facility and automatic on / off functionality. This unit can be placed easily underneath the LEF-12i.